Grab your racquet as you’ve just received an exclusive invite to the All England Club in London to stand in as a last minute replacement and compete against the best tennis players in the world on centre court, with rewards of up to 450,000 coins on offer if you can progress to the final and land the gold trophy to etch your name in the history books as a Wimbledon champion! Centre Court has been developed by Microgaming and is a 5-reeled slot machine containing 9 adjustable paylines which offers a variety of coin betting options, with up to ten coins worth between 1p and 50p allowed to be staked per payline, meaning entry to the yearly tennis major will cost you a minimum of 9p and a maximum of £45 each time – a small fee to pay considering the massive prize pool on offer. On the court you will be able to showcase your skills by serving aces, hitting forehands and smashing backhands down the line but you’ll also benefit from a volley of 18 free spins which come with a multiplier worth between 2x and 5x on every spin, and the bravest players amongst you who like to come to the net and take risks to force the action can even take advantage of a gamble bonus feature in order to increase your smaller winnings and have a larger cheque written with your name on it. You’ll hear the sound of a tennis ball being bounced off the grass before a serve every time you click the spin button, with a total of twelve different symbols featuring on the reels to enable you to create winning combinations and take a piece of the prize pool. Of course, it’s the gold trophy that looks identical to the Wimbledon Gentlemen's Singles Trophy which is the most valuable symbol of all with five on a line resulting in a win worth 1,000 coins, plus it is also the Wild symbol with the ability to substitute for all but the Scatter (which is represented by a tennis ball). Of the standard symbols it’s the Match Point image which is worth the most plus you will also encounter four different tennis stars two of whom are male and two are female, although it’s a little disappointing that photographs of real tennis superstars don’t feature on the reels. There is a male smashing a volley, a female returning a serve, a male hitting a backhand, and a female hitting a forehand, plus low valued symbols of Ace to 10 feature on the reels too. You’ll be enjoying a volley of free spins once you see three or more tennis balls (Scatter symbols) on the reels at once as this initiates a very rewarding free spins feature. Firstly, you will receive a Scatter payout of 3x your stake for three tennis balls, 30x your stake for four tennis balls, or a massive 500x your stake for five tennis balls, before being rewarded with 18 free spins. As if that number of spins wasn’t generous enough, each of them come with a mystery multiplier bonus attached worth between 2x and 5x and you can even re-trigger additional free spins. Tennis players are always taking a gamble to win points, whether it be to risk coming close to the net and get caught out by being lobbed over or to attempt a drop shot only to see it catch the net and drop back on your side of the court, therefore it should come as no surprise that Microgaming have included a gamble feature in Centre Court for you to take risks too. After winning combinations you will have the opportunity to enter gamble mode to either double or quadruple your winnings. To double them you will simply have to choose if a playing card will be red or black, while to quadruple them you must choose the exact suit it will be. 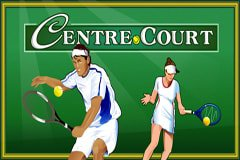 Centre Court is certainly one of the best online slots with a tennis theme therefore it is no surprise it has proven to be so popular at UK online casinos. With the lush grass of the Wimbledon centre court as the background, you’ll encounter four different players on your journey to landing the gold trophy and being crowned champion!